Are you requiring a shelving solution that’s tailored to your needs? Why not store your equipment, stock and resources with Longspan Shelving / Space Saver Shelving? ADS are an industry specialists for all storage and display solutions! We tailor a Long span shelving packages to your individual requirements. Long span shelving can be installed using individual and/or adjoining bays to create your dream storage solution. Our range of size available are below or simply contact us on 1800 111 477 to discuss Longspan Shelving with our team of specialists. 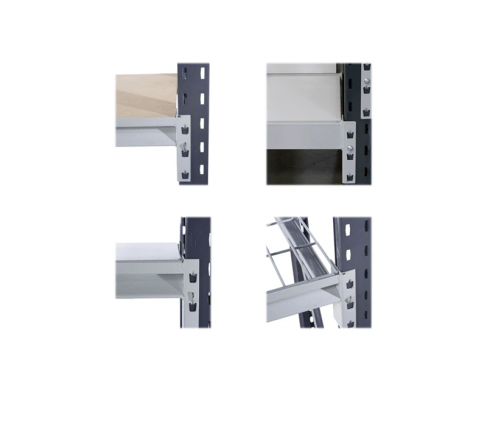 The Longspan Shelving is completely adjustable shelving systems to suit your requirements. Longspan shelving is also known as Space Saver Shelving, this is a heavy duty storage system which can hold up to a massive 2 tonne per bay, making it perfect for your every requirement. Need a complete shelving fitout? Simply Contact Us Today on 1800 111 477 to discuss your storage situation. Configurations of individual or adjoining bays can be installed to ensure maximum potential space can be utilised to gain maximum storage efficiency and organization. Not sure where to start? We are ready when you are! Here are 4 Steps to assist with planning the storage system that works for you! 2. Do you require the bays to be adjoining? 3. What style of shelf for you require? Standard bays come with 4 x splinter FREE MDF shelves. Add or remove shelf quantity to your requirements. 4. Contact the team on 1800 111 477 with your requirements for a FREE quotation today! *Free measure up & installation services are available to Brisbane region clients only. Please contact us with your location to check eligibility for this service. If you are out of the Longspan Shelving Brisbane region please do not hesitate to send though a plan of your requirements with measurements and one of our Longspan Shelving specialists will be in touch. We are always happy to provide our free layout planning service.